If you have on-site or in-house rebar fabrication capabilities, stock rebar is a great way to save money on your project. PJ's Rebar offers import stock rebar in standard sizes from #3 to #6 in 20-0 and 30-0 lengths. We’ll source it and ship it to you in the quantities you need, and you can cut, bend, or otherwise fabricate it yourself. PJ's Rebar sources import stock rebar from a number of reliable foreign mills. With imported materials, pricing can change frequently and shipping must be arranged well ahead of time. We will work with you to make sure the costs fit your budget and the shipping schedule fits your timeline. We also offer 20-0 and 30-0 domestic stock rebar and 40-0 and 60-0 stock rebar. 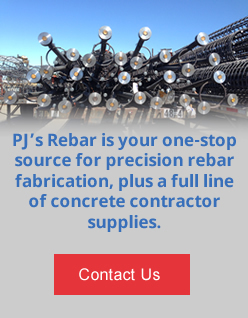 Make PJ's Rebar your #1 source for import stock rebar. Request a price quote today, or contact us for more information.